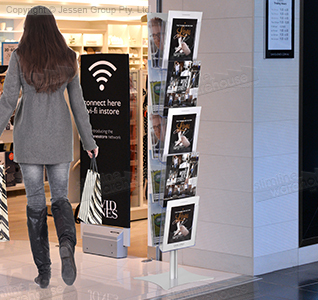 This brochure holder display stand helps you provide literature or magazines to visitors at your business, trade show booth, retail store, or doctor office. The acrylic literature racks have (10) clear acrylic pockets that are slightly angled to help make taking items out easily. The clear view lets patrons know exactly which item is available. This literature display is easy to set-up too, with only simple tools needed! This magazine display system, brochure holder display stand uses adjustable pockets so you can easily position each one where you want. The dual-sided display has a small footprint whilst still maximising space at your business to reach more customers. 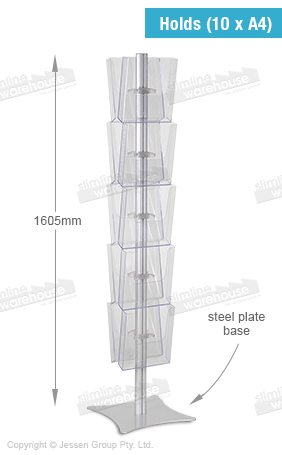 The base of the literature rack is made from steel to ensure stability in any location. The online catalogue is full of hundreds of different items that may be used around your business for a variety of different purposes. Slimline Warehouse has been a leading provider of POP, POS, retail, & exhibition displays for over 20 years, using high-quality goods at low prices to help build a large customer base. Despatch is provided to Sydney, Melbourne, Perth, Adelaide, Brisbane, Canberra, Toowoomba, Newcastle, & anywhere else in Australia same day with most in stock products purchased prior to 1pm EST!